Here’s how you play 100 Pics – You will pick a category. You must choose one of the Free categories (4 different categories to choose from that are Free), and play through it, so that you can accumulate enough coins to access other categories you want to play through. 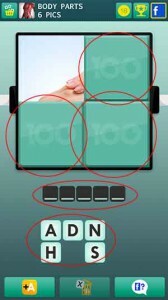 When you first start a level, you will notice that the picture is covered by 4 squares. You will have to click on one of the squares to see what the picture is; however, if you click on all four squares you will only receive 1 coin for when you correctly answer. So it is best to just use one square so that you can get 3 coins. Blank spaces are below the picture–with a letter bank beneath it. 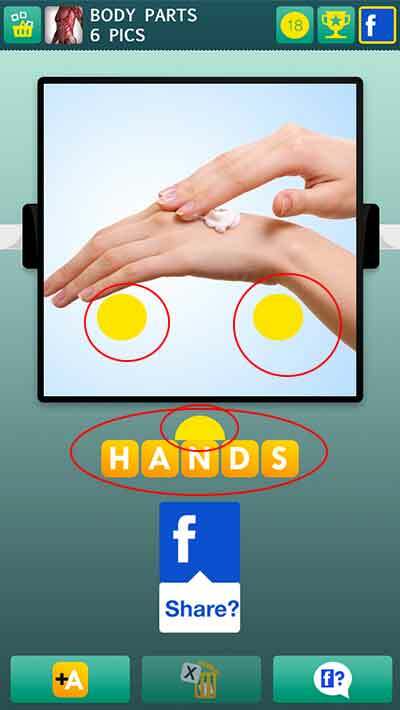 When you have answered correctly, you will receive your coins and move on to the next puzzle in the level category you have chosen.If you find that you need help, 100 Pics has 3 different hint options to choose from – Reveal a letter, remove a letter, and ask someone on Facebook. But those hints will cost you a lot! Almost around 50 coins for just 1 hint. And remember you can either get 1 or 3 coins, so you will need to spend some real money if you want to use their hints! 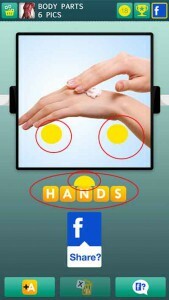 That is why we suggest you use our tips, hints and 100 Pics cheats answers!